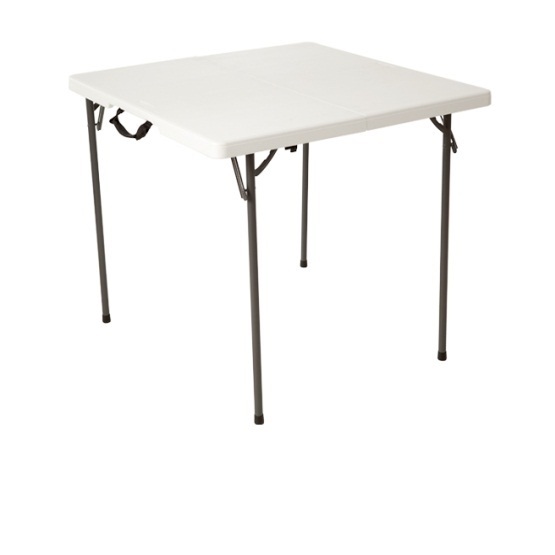 34" Lifetime Card Tables - 80273 White Fold-in-Half Folding Table. Lifetime card tables model 80273 feature Lifetime Product patented polyethylene plastic and combines it with their unique, fold-in-half design for even more convenient storage and transportation of your card table. This 34 inch square table features folding legs to collapse the table and a fold-in-half table top using metal hinges. Polyethylene plastic is resistant to fading, cracking, and peeling, which means this Lifetime table can be used indoors and outdoors as needed. This type of plastic is also easily cleaned and maintained. 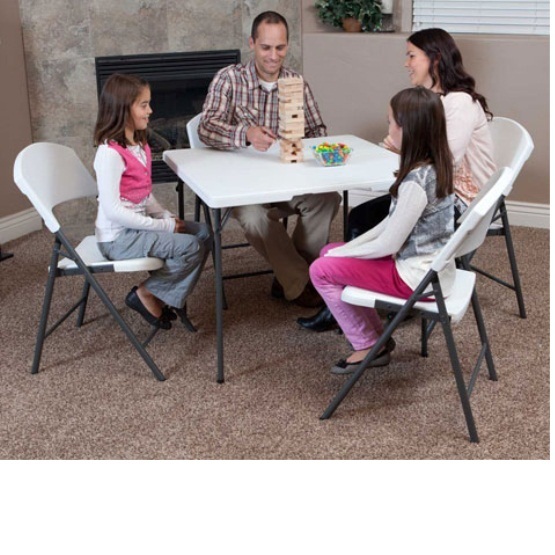 This table is great for a family get-together, for dining, and for game nights. Table top color: white granite. Table top can fold in half. Table legs fold to collapse the table. Plastic table top is resistant to fading, cracking, and peeling. Steel portions are powder coated to help resist rusting. Comes with a 1-year factory warranty from Lifetime Products. Table top unfolded dimensions: 34 inches x 34 inches. Collapsed table dimensions: 34 inches x 17.6 inches x 3 inches. Table top unfolded height: 29 inches. Table top thickness: 1.5 inches. Frame tubing dimensions: 0.87 inches diameter. Table weight: about 20 lbs. Recent Review: "The group loves the table, it's light weight, and easy to set up. We placed our name around the table and underneath, so that it doesn't get misplaced. Many thanks to you and your company. Ken"
I have been looking for a card table for a year when I saw this one on their web site. We have other Lifetime tables and they are sturdy and easy to keep clean. 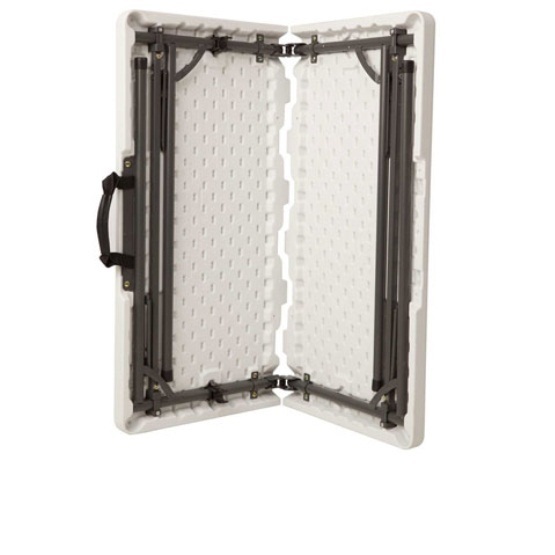 The selling feature of this card table is that it folds and easy to put in our car. The height of this table is 29"
The good been shipped shortly after the order been placed, and the goo arrived as described on the website, which all indicate Competetive Edge is a trust worthy seller. This is an excellent product, and I am thrilled with it. 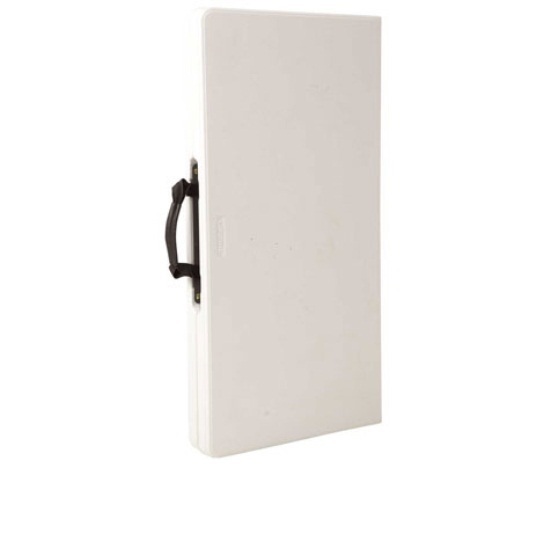 It is extremely well made, does not wobble, and is so easy to fold and carry from room to room. I bought it primarily to set art objects on when I wanted to clean the shelves. This table allows me to take glass and china objects off the shelves, set them in the order in which I have taken them off the etagere, clean them and the shelves, and return them to where they originally sat. I do not have to worry about bumping into it and knocking things over, which could be a disaster. When I am finished one area I can fold up the table and move on to the next spot. And I can store it in the closet without taking up much room. This is perfect for my needs. I just wish I had found it sooner. Q: How Much Weight does this hold? A: This square fold in half table has a weight capacity of 400 lbs evenly distributed or 150 lbs if a center load. Q: How thick is this table when it is folded? 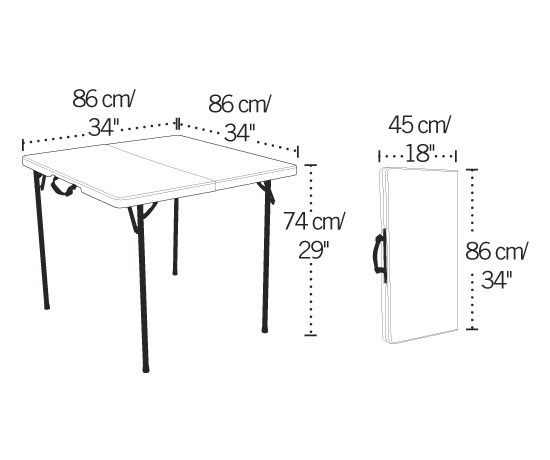 A: The collapsed table dimensions are 34 inches x 17.6 inches x 3 inches. Q: Does this fit in the trunk of a car? A: Yes, it can fit in the trunk of most cars. A: It is made in China. A: I am looking for a card table that does not have carcinogens. Is this table without carcinogens? Fast Shipping: Orders for the 80273 Fold in Half Square Card Table generally leave the warehouse the next business day. Dimensions: 34" x 18" x 4"